Its getting good and dark in Olso now, with rain and fog and not really snow or ice yet. I've still been driving a Nihola to work as its the easiest for for me to get my son to and from his daycare. The tab mounts above the wheel wells are located below the top of the cargo box, so lights on those mounts are not visible from the opposite side of the trike. The Nihola store sells little lights for the wheel-well-tabs in white and red, powered by 2x AAA's, and a person would have two of each, ideally. I have two types of these lights, one is bright and focused while the other is more of a marker light, presumably with improved battery life as required by a Danish law from 2012. (Both may have had the Abus brand but I've never seen them for sale online.) I think its a real shame lights fitting those mounts are hard to find, because I also have 3 or so plastic mounts for that standard which can be placed anywhere on a bike, and I have maybe 9 lights that fit all these, so I can easily move them around between bikes and locations as batteries weaken. Yay for standardization. A brighter, more focused red with a dimmer, unfocused white. Anyway because of the problems getting these lights, on one Nihola I drilled holes in the front mounting tabs which I can use to mount any sort of fork crown compatible light. I put some inexpensive 0.5W lights powered by AA batteries on. They stand up kind of goofy-looking but I think that improves their visibility. On the baggage rack of the same Nihola I also installed a Reelight SL620 (flash with backup), which is worth spending some more time on. A fork-crown light mounted on a Nihola. Reelight is probably the best supplier of battery-free lights for a Nihola. 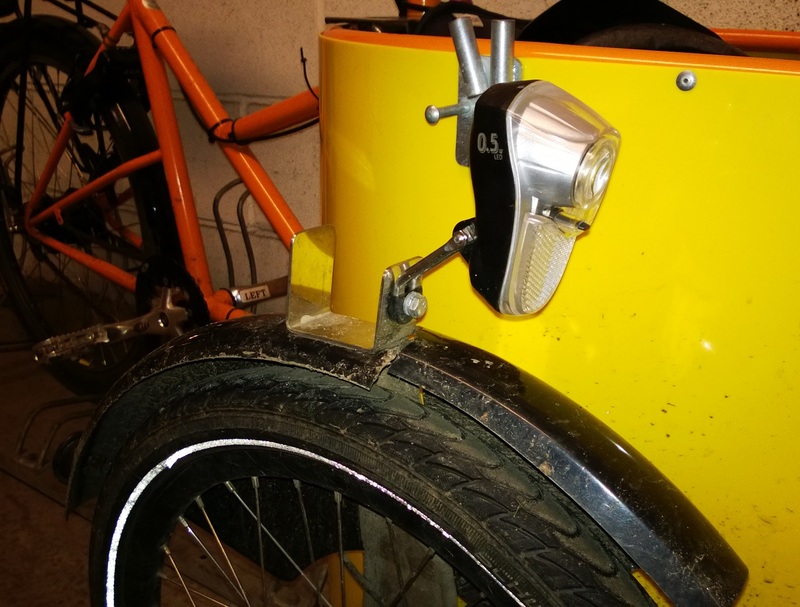 Their top model (RL720) has a 2 meter cord for the front light according to Reelight (via an email), so the generator should be mountable on the rear wheel, while powering a light mounted on the tab above a front wheel. This is probably the only dynamo headlight option for a Nihola. I'm pretty happy with my battery front lights so far, so haven't tried this out yet. I also am not sure I want to drive a semi-powerful headlight all summer, and there is always the concern when using a hulking cargo bike/trike in the winter that it might not be possible to go fast enough to properly illuminate a dynamo light. 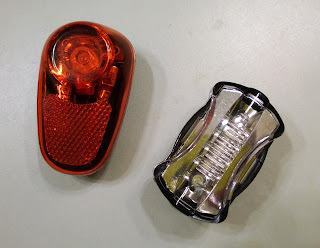 But anyway, they also make stand-alone rear lights for a baggage rack or seat post which are quite effective without adding any perceptible drag. As I mentioned before, I have one on the baggage rack of a Nihola. 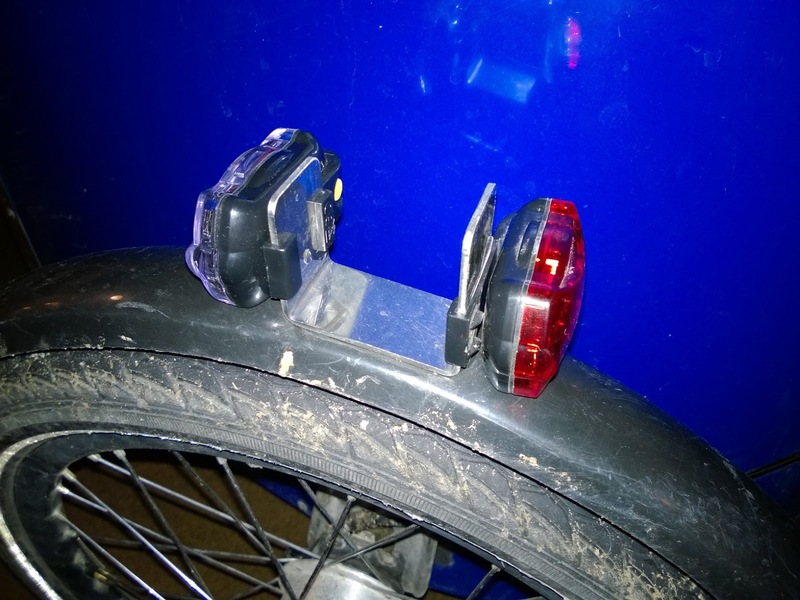 This is usually my only rear light, but when its dark and rainy I like to turn on a supplementary battery-powered rear light or two, which sit on the mounting tabs. So thats the story of lighting for Nihola. On our two (soon to be three) regular "Danish-style" commuter bikes, we have a Dynanmo hub and various Reelight models. No battery lights. Add full fenders, hub gears and robust tires, and we're ready to go day or night without screwing around. Greetings from Australia, I'm a huge Nihola fan too and just had mine delivered all the way over this side of the world. Thanks so much for writing this post. I had no idea what those tabs were for and was wondering where to attach my front lights ( even the guy who did my e-conversion in Australia didn't know) after much googling I stumbled on this blog.